Some trends are hard to get behind, while others are so practical and stylish that one wonders why it took so long to take off. Case in point: the belted trouser. For their Spring/Summer 2016 collections, fashion labels such as Celine and Tibi had belted trousers that were styled with masculine separates, such as white shirts with long, voluminous sleeves or sleeveless trench coats. The good news is that this trend is not limited to just trousers or coats. The style works just as well for shorts, skirts, dresses and jumpsuits. Here are some tips on how to pull off belted styles: • For the best slimming effect, make sure the belt is tied at the smallest part of your waist and not your hips. 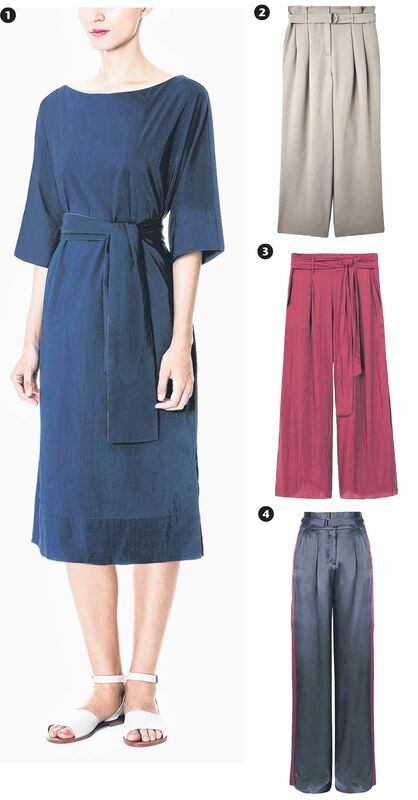 • When wearing belted bottoms, tuck in your top to emphasise your waist. • Play with proportions: Wear a long cardigan or a cropped jacket with wide-legged, high-waisted trousers to emphasise your waist. • Those with a lanky physique can pull off belted bottoms that are slung low on the hips. For petite women, high-waisted styles are more flattering. • Let the length of the belt fall naturally for an easygoing vibe. You want to look pulled together, but not uptight. A belted dress is one way to stay on trend without having to think about coordinating separates. The obi-inspired belt and boat neck neckline will help create a V-shape silhouette and make your waist look trim. These trousers have a dropped crotch and are cut wide at the leg. Best for lanky body types and worn with a fitted top. These palazzo trousers have an elastic waistband at the back for a comfortable fit. Wear this with a boxy, cropped T-shirt and sandals. The satin material makes this pair perfect for work or evening functions and the high waist is flattering for petite women. Pair with a printed, chiffon blouse or dress it down with a slogan T-shirt.